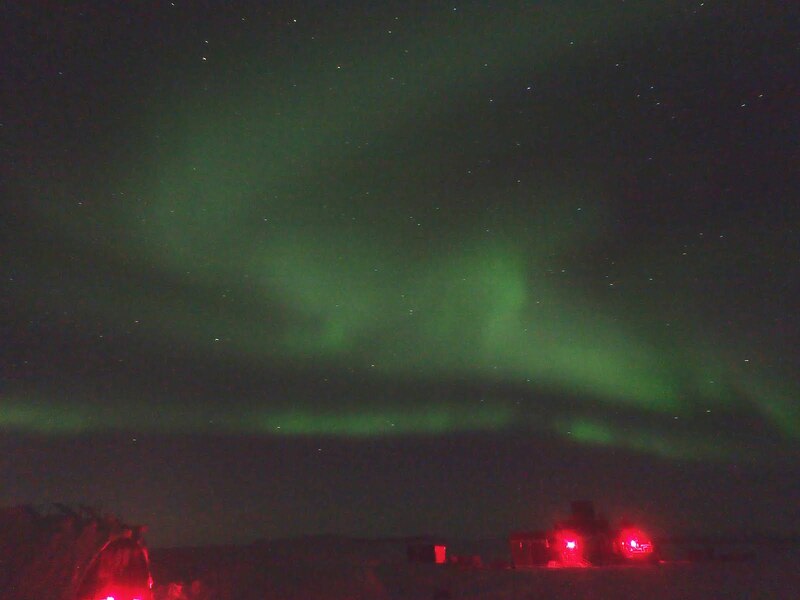 There have been a few major events down here at the South Pole since we last posted. With the internet not working too quickly it has been a challenge to try and get anything uploaded; however, with a little bit of persistence and lots of waiting we might have a few photos and stories finally ready. Yuri’s night. This is a fun party hosted by a station regular. When I say regular, I mean this is Robert’s thirteenth winter at the South Pole. Wow! Robert loves space. He has in fact been teaching us astronomy every Tuesday night, and it is only natural for him to want to commemorate the first human being who made it into space. In 1961 Yuri Gagarin made it out of Earth’s orbit and over fifty years later we are still celebrating that moment here at the South Pole with Yuri’s night. One is encouraged to dress up for this event in a space themed outfit. This normally involves a lot of aluminum foil, super creative costumes, at times planning years in advance, and then some dance music once everyone has congregated. As you most obviously deducted already from the picture, Sarah and Catherine came dressed as Space-women and I am an unfortunate polar bear taken captive from another planet – obviously a planet where polar bears are the dominate species where they walk upright, speak English (oddly enough), and as of this year have engaged in a bitter war against all Space-women after the uncouth kidnapping of Berangle the IV. As shocking as this all might sound to hear of Space-women abducting a noble polar bear, they made up for this atrocious fact by bringing their space rover with them to Yuri’s night. Not only does it explore new planets but it also offers a mini-bar with ice and drinks, even for kidnapped polar bears. So that’s kind of nice though it does not quite balance out their earlier actions. Not long after Yuri’s night we celebrated Easter. As a Christian I was pretty excited to be somewhere like the South Pole for Easter. It is actually one time of the year I am excited to be most anywhere, but for some reason the idea of experiencing the joy of the resurrection down here put a slightly different spin on it for me. Perhaps there is a powerfully symbolic act in focusing on redemptive hope and life as the world around us here becomes darker as true winter takes hold. It makes me think of the verse in John 3 where he says that light has come into the world but people loved the darkness instead of the light. The light will not be overcome. Living in perpetual darkness, and knowing the sun is months from returning, lends to many thoughts on how wonderful Easter truly can be for us. Hope is always there. God loves us so much that everything was given to show this love. There is nothing God cannot fix. There is a light that cannot be extinguished no matter how dark things seem. So much more! One of our guys went above and beyond all the call of duty in organizing fun events for fellow co-workers at the station by organizing an elaborate Easter Egg Hunt. Yes he hid eggs all around station and even outside. Do not worry, we hardboiled them and decorated them for good measure first. This good man then created thoughtful hints for us to follow and labeled various eggs worth more points depending on location or the decoration of the egg. Sarah and I teamed up and managed to get second overall, being overtaken in the last hour or so by a superb team of South Pole gentlemen. The prizes? Three baskets of delightful goods from the store and even some stuff one cannot get on station. Our second place basket had a bottle of wine, candy, stickers, a sweet NPX (that’s our airport ICAO code which is super cool), and other various goodies. For an event that was free to join the prizes were simply extraordinary. I managed to get a little bit of what could be called frostnip (although I’m calling it wind burn) on my nose while I was outside wandering around looking for the high point eggs. No worries as I am all better now, mostly! Well we have been getting some work done down here too. In materials we have been doing inventory, some more inventory, and when we need a break we do more inventory. Yay! It is not always fun counting for endless portions of time but we have a great team and we find ways to make it enjoyable. When I am feeling especially inventoried out I use the big guns – I tell myself inventory is the key to survival down here. If the counts for the parts to the power plant, or the amount of food we have (which would be really hard to get so far off it’s super detrimental of course), we could find ourselves in an interesting predicament. So I count with more fervor and sharpen my mind against the demons of laziness. Yes Sarah’s job is clearly of a higher import than mine, but that does not mean I cannot tell myself what I need to hear to get the job done right. That last line was said in a sardonic tone and a smile on my face, at least it was in my mind as I typed it out. Church services on Sundays have been going well. There are five of us who gather together and we are reading through the book of Acts. We use a lot of videos for worship or even for our lessons if they fit so feel free to comment and offer suggestions if you have any or know of any online. We do not have much internet to download things like this but I’ve managed to get a few that have helped out. It has been fun to use worship songs from Hope Church as they have offered a lot of support to us for this winter over. Not only did they give us shirts for everyone on station but they have also been praying for us while we are here too. Please feel free to think of us often and if you do pray lift up the entire station. As we get further and further into the cold dark months of winter people tend to find more and more faults with one another. We cannot leave and spend all of our time around only forty-six other people. Keep that in mind as we look for patience, kindness, and understanding down here. Speaking of fun religious stuff, one as day I was walking out to do some inventory of a milvan out by our cargo office with our amazing materials team the moon decided to put on an amazing display. 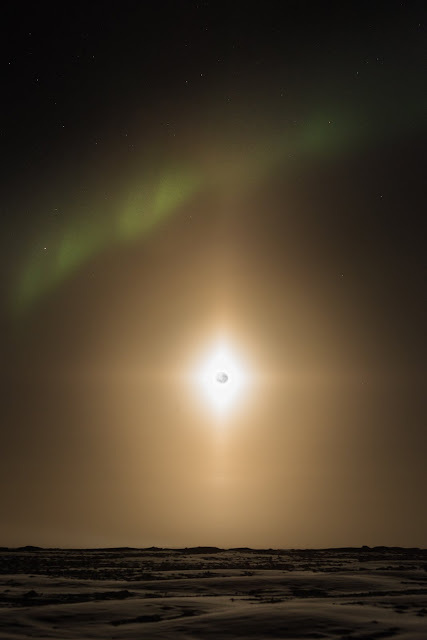 Well technically the ice crystals in the air, as it has been explained to me, decided to put their mysterious effect on the moon beams to create what is known as a moon pillar. We had seen one of those about a month before, as seen in the great pic Sarah took, but this moon pillar was a moon cross! So beautiful and to my knowledge no one was able to take a picture that quite captured just how spectacular it really looked (that comment includes the picture of Martin’s in this post - great pic but still lacking). Naturally I reveled in this moon cross and had my own personal spiritual moment, contemplating the possible meanings of a cross of light hanging in our winter sky. It was a sight to behold. It has been interesting learning more about the science done here at the Pole, and even astronomy as mentioned earlier in the post. The more I learn the more magnified the Creator is by it all. I know most of what I am learning is even evidence some people use to discount God, but I have never found science and belief in God to be in conflict. For one of our recent astronomy classes we went outside to learn firsthand. It is amazing to note the differences that exist between the northern and southern hemisphere, and then even more so the strange oddities of being at one of the two poles. Gazing out at the clear strip of the Milky Way stretching all the way across the sky, pondering the significance I see in the Southern Cross, and trying to drink in everything else Robert was saying about the sky above us, I was struck by intimacy. Standing beside Sarah at the South Pole under the vastness of the southern night sky I was not filled with a vacant feeling of the infinite universe. Instead I was filled with a gracious love and overwhelming thankfulness. The sky was not quietly whispering of my Creator’s love for me but was magnificently shouting of its sound hold on me and those around me. I reached out and put my awkwardly bulky gloved hand on Sarah’s arm, thankful we were sharing this together and for her heart. We just gazed at the beauty of darkness penetrated by light that has traveled thousands of light years to shimmer above us. Black holes, red giants, white dwarfs, nebulas, galaxies, and all of the other stellar sights to behold. Wow!! Then we ran inside to warm up. An update on Sarah’s unicycling – yes I’ve quit at this point not because of the difficulty really, though it is quite that, but in the hopes to stay healthy with no injuries to parts of my body I would rather keep quite well. Sarah on the other hand has been excelling and her one wheeled skills have been rapidly improving. I watched her ride the entire length of the gym with a big smile on her face. She did use the padded wall on the opposite side to come to an abrupt halt, but she successfully is very on her way to joining the circus when we get back. Too bad the Ringling Bros. and Barnum & Bailey Circus will no longer be around to recruit her. Sometimes you have to put down your stethoscope and seek after your precariously balanced dreams – at least she would get some elephant time if it ever worked out. Outside of those updates, our time here has been going very well. I’ve been enjoying that my job takes me outside quite a bit and have been taking in the beauty of the Antarctic night. Sarah has been enjoying being the doc and to my knowledge has not had many patients. There are the random incidents that do occur now and then, such as the booze barn heater going off one night. For some reason the alarms did not alert the crew here and you can see from the picture the result of what happens to soda when exposed to the temperatures here. We have also had various other events: a poker tournament one weekend, a spa weekend (one of our guys is a licensed masseuse! ), and there is a tiny little lamb that gets hidden around station as a scavenger hunt for prizes every so often. Life at the Pole is a little different but it is definitely life. If you ever have questions feel free to leave a comment and ask about specific things or topics you would like to hear about. Were you correct about which eggs Sarah painted? Here they are!